I drank a bottle of the 1995, the first release, next to a 1993 Rousseau Chambertin-Clos de Bèze in Beaune. The wine just released was rich, powerful, and, had all the hallmarks of greatness. It was hard to say which had the greatest depth and length of fruit at the time! The wines of Côte-Rôtie (the roasted slopes) and Hermitage in the Northern reaches of the Rhône Valley, have justifiably garnered critical acclaim. Where Hermitage reds are 100% Syrah, the wines of Côte-Rôtie, it’s neighbour to the north, are often blended with a small percentage of Viognier. These very wines provided inspiration in pushing the growing and making of Shiraz at Yarra Yering’. The ‘Underhill’ 100% Shiraz and the Dry Red No. 2 a Shiraz Viognier blend with a splash of a couple of other Rhône Varieties in the mix. It’s not surprising that we drank a truckload of Rhône wines at Yarra Yering. One Easter weekend during the 2003 harvest Doc, myself and one other, were doing a half day picking a few buckets of fruit and maintaining the ferments. We pulled stumps at about 1pm. Doc, made his way to the cellars and popped back up with a 1994 La Turque. One of Guigal’s trilogy of top Côte-Rôties along with La Mouline and La Ladone, affectionately known as the La La’s. We start a glass, baiting Doc,”We really need to try the other two to understand what’s going on!” Doc disappeared. A couple of minutes later, all three were in front of us. Drinking these wines was fascinating, the La Mouline incredibly opulent, Viognier shining through. La Turque, structured and earthy. La Ladone in the middle, with perhaps the best line, length, and, harmony for the wines on the day. It made us think about layering in extra depth of tannin, how we could add another level of sophistication to the mouthfeel. Just how could we bring more of the inherent complexity in the fruit to the fore? At around $700 a bottle the La La’s, are a rare treat. 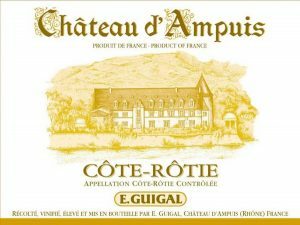 Just one rung further down the ladder, for one third the price, is Guigal’s Château D’Ampuis Côte-Rôtie. The quality of this wine has been rising year after year and is a lot closer to La La territory than the price reflects. Today we offer a suite of wines from Guigal. 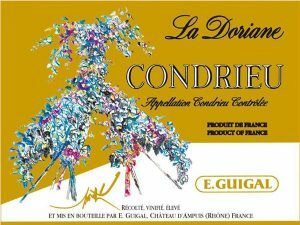 2 Viogniers: 2015 Condrieu, and top Condrieu wine 2016 ‘La Doriane’, stunning white wines. A Syrah Viognier: 2012 Château D’Ampuis Côte-Rôtie in both 750ml and Magnum! The perfect way to compare the components of a Syrah Viognier and the final blend. Unfortunately, we couldn’t get enough La Mouline (89% Syrah 11% Viognier), La Ladone (100% Syrah) and La Doriane (100% Viognier) for the comparison. If anyone has these on hand, give me a bell and I will be at your doorstep before you can pop the corks! The Contrast – 3 Wines: 1. Viognier from Condrieu (white wine) 2. Syrah 100% from Hermitage 3. Syrah 93% Viognier 7% from Côte-Rôtie. It makes it so much easier to find the differences and helps you to appreciate each wine’s qualities. Having a glass for each wine is the way to go! If you’re up for it taste them all at once with some scaly mates. Tasting Order: I’d recommend trying them in the following order: Viognier, Hermitage, Côte-Rôtie. Make sure you just smell them first and compare the aromas before tasting. In comparing the three remember that Hermitage is some 50km south of Côte Rôtie and will offer a different personality to 100% Syrah wines from Côte Rôtie. Aromas: Viognier: Look for a perfume of orange blossom, floral notes, apricot, citrus pith, spices like cinamon. Hermitage: Look for darker black fruits, the wine has aged sufficiently to have some ‘secondary characters’ these develop as the wine age and the youthful fruit gives way to more complex and expressive, earthiness, forest floor, savoury and sometimes truffly characters. Côte-Rôtie: With the blend of Viognier you should see a mix of the perfume and flowers playing with the darker fruits of the Syrah giving it an intoxicating scent. Flavours: You’ll see the characters from the aroma carry through to the palate. Tannins & Texture: Here you’ll notice a big difference between the Côte-Rôtie and Hermitage in particular. The blending of the Viognier and a degree of suppleness, the wine caressing your palate compared with the slightly more structured Hermitage. When your tasting, think about the 5 elements below, they’ll make it simple and ensure you cover off the important aspects of good wine. We’ll be exploring these in detail in a series of posts for members only soon! To Play: If you are up for it, you can play winemaker. Grab a fourth glass and tip about 10% Viognier and 90% Hermitage into it and watch the wine change before your very eyes! The result won’t be as good as when done just after the grapes have been picked during fermentation, but, it gives an interesting insight. Temp: For the reds 16°C. We tend to drink reds an edge warm. There’s nothing wrong with chucking the bottles in the fridge for 15minutes to drop a few degrees off them. If they end up too cold they’ll warm up quickly in the glass. For the Condrieu 12-13°C works well. Decanting: For the Château d’Ampuis. Definitely, if drinking it under 10 years old. It will probably be better the next day! Gentle decant for the Hermitage. Both Condrieu will handle a decant too. ⏳Time: I love trying good wines stand alone, with food, and, often the next day. It gives them the chance to shine and ensures you don’t miss a good wine through impatience or fail to bring out it’s best by not marrying them to food. Cellaring: Château D’Ampuis Côte-Rôtie tends to go through a couple of phases in the cellar. On release, they are bold wines. Over 3-10 years they harmonise and secondary development starts. The real magic happens from 15+ years, they hit a phase where they appear almost transparent to taste, yet retain incredible depth of flavour, the complexity levels lift another notch, keeping you entranced by the wine’s scent alone. For the Hermitage, it’s drinking beautifully now at 8 years of age and will continue to do so over the next few years. Both Condrieu are great to drink now and over the next couple of years. 數Food Match: For the reds just think red meats, braises, pork, rabbit. As they reach the third phase go with the lighter meats. Condrieu, is no shrinking violet, Guigal actually list the following, drink it as an aperitif (it is a stand alone meal), foie gras or scrambled egg and truffles. Delicate fish. It will happily hold lighter poultry, veal and pork with more delicate sauces. Grab a Coravin wine preserver. Watch this video, “Stop the Wine-ocide” Kaani 2012 – My Deep Dark Secret, one of my first, about saving open bottles of wine from the drain, sorry about the quality, but, the message is still there. The blending of Shiraz and the white grape Viognier originated in Côte-Rôtie. The interplay between the two varieties is truly something special. Co-fermenting rather than blending finished wines simply results in greater harmony and expression. The colour of the wine becomes darker as a scientific phenomenon known as co-pigmentation occurs, small compounds from the Viognier stabilises the large colour compounds from the Shiraz. Perfume, flowers, and, spice from the Viognier adding intrigue to the aroma. Making it so much more inviting! Those aromas carry through to the palate where the last bit of magic happens. The tannins develop differently to 100% Shiraz wines, beautifully refined, and, silky they offer a wonderful feeling in your mouth. mouthfeel. Tim Kirk from Clonkilla was kindly sent me a mixed case, including some experimental wines not for release. In it, 3 wines, 100% Viognier, 100% Shiraz, the components of his Shiraz Viognier, and, the Shiraz Viognier itself. A fascinating tasting, you could see how each of the component wines contributed to the blend. The blend just had something extra. This is the result of fermenting the red grapes of Shiraz with the white Viognier. The chemical soup that exists during fermentation ends up coming together to be greater than the sum of its parts. In Côte-Rôtie the vineyards are mixed plantings with Viognier vines next to Shiraz, all picked at the same time. The proportion of Viognier ranging from none up to 10-12%. The Vixen Viognier comes to us in many forms. At one end of the spectrum, they are vibrant fresh, acid driven wines, with low phenolics (small tannin molecules that can add to the texture of white wine), at the other they are bold, full-bodied, unctuous wines with an almost oily texture that caresses your tongue. Each maker has to decide where on the spectrum they want to sit. The biggest influencers of style being picking time, extraction of phenolics at pressing or through skin contact, and, the vessel the wine is aged in prior to bottling. Fresher styles will be picked earlier, will be pressed gently, have little or no skin contact, and, be fermented and aged in stainless tanks. Fuller bodied styles will be picked riper, incorporate great levels of phenolics through crushing grapes breaking the skins, pressing harder, or, incorporating a period of skin contact. Typically the will use oak for a portion, to all of the maturing wine. Guigal’s Viognier’s are unique expressions, particularly the La Doriane. When I first tried La Doriane I was blown away. I’d never had something with this kind of texture and power. It was a beast, one that I enjoyed devouring. Where a Chardonnay made like this would likely be undrinkable. The La Doriane was, yes extreme, yet, giving of so much pleasure. The winemaking side of me need to know more. I had the acid levels analysed to find a pH of 4.0 and a Titratable Acidity (TA) of 4g/L. Normally a white wine of this style would have a pH of about 3.4 and a TA of 6.5. Basically it would have a load more acid, the lemon juice character in wine. Technically these numbers are unheard of. 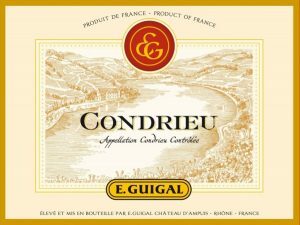 In recent times, Guigal, have pulled back a little and we are seeing great freshness in their Condrieu. You’d think that Shiraz would be easy to explain. The relatively recent expansion of cool climate vineyards throughout Australia, and, experimentation with a wide array of making techniques has seen an increase in the diversity of styles produced. Think Canberra, the Yarra Valley, Adelaide Hills, and, Mornington. At the same time, the warmer, established regions like the Barossa and McLaren Vale are rapidly evolving the styles of Shiraz they produce. A new wave of producers are making wines of restraint, and, elegance, through earlier picking and careful handling of fruit. In the Rhône Valley, particularly around Côte-Rôtie, Hermitage and Cornas, we see some extreme vineyards that climb into the skies from the Rhône River at calf breaking angles. Some, terraced, others taking rocks that have made their way to the bottom of the slopes, on an annual pilgrimage back to the top. When you have exceptional Shiraz the opportunity to experiment with whole berries, whole bunches, stalk use, cold maceration, extended maceration, fermentation vessel, maturation vessel, cap management, and, any of 1,000’s of other variables is possible. In Australia, we are seeing increasing use of whole bunch ferments for at least a portion of the fruit. The perfume, stalk tannin-rich wines, layering extra dimensions into the aromas and textures of the typically more restrained wines. Over time ‘fashions’ have shifted from blends to single vineyard wines. Perhaps driven by the popularity of Burgundy, we’ve seen the Barolista making single vineyard or Cru wines as they call them, Australia has followed, in the 70’s Guigal launched the La La’s, creating three of the now most renowned single vineyard wines of the world. Staunch ‘terroirists’ will claim a wine loses its identity, it’s sense of place if blended. Personally, I just want to drink great wine, whether, blended or single site. Aldo Conterno’s top wine is a blend of three adjacent vineyards, Vietti’s Castiglione represents, perhaps, their best value Barolo, and, often includes the fruit from the Villero vineyard, that, in exceptional years makes their Riserva, Sandrone’s Le Vigne is a blend, yet all of these wineries also make single vineyard wines. With my consumer hat on I just get to enjoy the fruits of their labour! Château d’Ampuis is a blend of 7 terroirs. Is it compromised because of this? The vineyards run along a thin strip a few kilometres long, a few hundred meters wide, alongside the Rhône river. In Australia some of our great wines have historically been blends made from grapes grown in the Barossa, McLaren Vale, and, the Hunter Valley, 1,000’s of kilometres apart. By comparison, blending across Côte-Rôtie is more like blending across blocks of a larger vineyard. Recently I had the pleasure of sitting down with Stéphane Ogier and trying his Lieux Dits, which translates to ‘said location’, and, refers to a specific site akin to a single vineyard. Trying 6 of his Lieux Dits across both the Côte Blonde and Brune was a fantastic experience, as Stéphane walked us through the sites, terms like feminine, masculine, floral, savoury, earthy, and structured come through. Each wine had a great personality. Most would stand on their own, one or two looked to offer more structural elements, without the balance of fruit weight, although this judgement needs to be reserved given the youth of the wine. Tasting aged wines from the Ogier demonstrated just how much the blossom after just a few extra years in bottle. When we got to the blended Reserve, containing each of the Lieux Dits, the whole, was definitely greater than the sum of the parts. The poise and harmony of the wine were at the next level. So, my challenge to Guigal is to make a 4 pack with the 3 La La’s individually and a blend of the 3 La La’s! Guigal is one of those epic wineries that can make a bucket load of Côte du Rhône, put it on the shelf at around $20 a bottle, when many would be happy to pay $30, and, at the same time makes some of the word most unique wines. They have a built a legacy and in so doing dragged Côte-Rôtie from near ruin to the very pinnacle of the wine world. The decision to drive quality release the La La’s drew focus and investment to the region, today it is a vibrant, growing, and making superb wines of real personality. Today’s wines all hail from the Northern part of the Rhône Valley between Vienne and Valence. Below you can see Côte-Rôtie with all of it’s vineyards mapped out. To the South you can just see Condrieu in the picture. Hermitage is some 50km further South down the Rhône River. Côte-Rôtie itself is split into to main sub-regions, the Côte Blonde and the Côte Brune. If you face the hill from the Château d’Ampuis itself to the South you find the Côte Blonde, where soils are heavy with granite and produce elegance feminine wines. To the North lies the Côte Brune, here the soils comprise mica schists and clay, yielding more masculine, structured wines. Like Burgundy, individual vineyards in Côte-Rôtie have been identified, named, and, clear boundaries established. Where Hermitage is dominated by 4 main producers, including Guigal, Côte-Rôtie, now has around 100 producers making wine from it’s 550acres of plantings. Château d’Ampuis is made from 7 exceptional vineyards from both sides of Côte-Rôtie, the Côte Blonde and the Côte Brune. These are exceptional vineyards, and in fact every vineyard is adjoining one of the three Guigal single vineyard crus, La Mouline, La Landonne and La Turque. The vineyards are in the Côte Blonde as follows: Le Clos, La Garde, and La Grande Plantée; and in the Côte Brune: La Pommière, Le Pavillon Rouge, Le Moulin and La Viria. Ampuis is composed of 93% Syrah and 7% Viognier, and aged in the same manner as the Guigal single-vineyard crus, with a 4 week maceration and alcoholic fermentation followed by 38 months in new barrels that are all made at the estate. The hallmark of Chateau d’Ampuis is an unbelievably seductive perfume full of sweet red fruits, black fruits and spices, and an elegance despite the intense concentration of fruit. Chateau d’Ampuis defines what a great wine should be with its beautiful balance, complexity and length. Grape variety – 93% Syrah, 7% Viognier. Average age of vines – 50 years Vines planted in the 16th century. Winemaking – Closed stainless steel tanks. Temperature controlled alcoholic fermentation, 4 week maceration. Ageing – 38 months in new oak. Average Yield – 36 Hl/hectare. The nose has a complex array of fine-ground eastern spices, strong cardamom, fine dark chocolate and ripe black cherries and plums. There's even some licorice. It has a neatly composed and elegant feel on the palate. It really flows long, rippling with spicy flavors and a smooth, dense and creamy finish. Best from 2028 and for a decade or more. A wine that will be in bottle by the time you read this, the 2012 Cote Rotie Chateau d’Ampuis (it always incorporates 7% Viognier) will check in behind the sensational 2009 and 2010, but should be on par with the 2005 and 2003. Cassis, licorice, smoked meats, graphite and peppery spice all emerge from this beautifully concentrated, full-bodied, seamless Cote Rotie that has building, ripe tannin, terrific purity and a blockbuster finish. It will have 20-25 years of longevity. This is lavishly toasted, with a frame of mocha, ganache and black tea notes, matched to a gorgeous core of raspberry pâte de fruit, blackberry puree and plum sauce flavors. Exhibits a long, alluring, polished feel through the finish. This has a ways to go before opening up. An epic year in the Northern Rhône. Hermitage is one of France’s most spectacular and famous appellations, producing small quantities of extraordinarily intense and ageworthy red wine and tiny amounts of dry white. The entire vineyard consists of 309 acres planted on a single granite hillside on the banks of the Rhône, planted to Syrah (100%) for red wine, and a blend of Marsanne (95%) and Roussanne (5%) for white. VINEYARD The Guigals own 4 parcels in Hermitage, planted on limestone, clay loam and sandy topsoils that lie above the granite mother rock. They will also purchase grapes from small growers. Overall, vine age averages 30 years. Guigal ages the various lots in barrel, 50% new for 36 months and assembles the wine before bottling. VINIFICATION The Hermitage was picked by hand and underwent a vinification of around 3 weeks. Aging took place for 36 months in barrels coopered exclusively by Guigal, 50% of which were new. Bottling was without fining or filtration. This robust and powerful wine especially needs the extended aging both in barrel and in bottle before release so that it can integrate and develop its bouquet and palate of black fruits, minerality and game. This is well-packed, with alder, anise and black tea notes leading the way for a core of juicy blackberry, plum and raspberry fruit flavors. Delivers a steeped feel through the finish, with a long charcoal thread. This is quietly always one of the smartest buys in high-end Northern Rhône reds. Best from 2016 through 2025. More brooding and backward, the 2010 Hermitage has closed down considerably since I tasted it last year. It offers lots of graphite, crushed rock, leather and smoky dark fruits, full-bodied richness, impressive mid-palate concentration, and a tight, closed feel on the palate. It needs 3-5 years of cellaring and will have three decades of longevity. Condrieu is the original home of the Viognier vine and is the source of one of the world’s most exotic white wines. In the mid 20th century this appellation had fallen to no more than 20 acres of Viognier remaining – at the time, the only 20 acres of Viognier in the world. Guigal was instrumental in bringing this appellation back from near extinction, and today supplements the production of their Condrieu vineyards with grapes purchased from numerous small growers, and ends up vinifying around a third of the entire appellation. The delicately elusive perfume suggests pears, spice, and honeysuckle, while on the palate the wine is surprisingly rich and full-bodied, full of fruit but intensely mineral, with a sappy, bone-dry finish. Truly a wine of texture, with a strong umami impression, and a wine for both the intellect and the senses. VINEYARD The tiny, parcelated appellation (500 acres total) is located on steep granite hillsides beginning at a bend in the Rhône river just south of Côte Rôtie and continuing intermittently about 12 miles further south. The granite hillsides have sand intermixed in their soils, and the vines for this wine average around 30 years of age, and only produce around 2.4 tons of fruit per acre. VINIFICATION 1/3 of fermentation took place in new barrels, maturation for 8 months was also 1/3 in new barrels. All the wine was aged in new barrels and underwent malolactic fermentation. Guigal’s 2015 Condrieu is a blockbuster that, if not for its big brother, would be one of the wines of the vintage. Aged in one-third new barrels and two-thirds in tank, it’s a rich, unctuous, thrillingly textured beauty that has plenty of orange blossom, flower oil, tangerine and peach. Fruit-loaded, with just a touch of minerality, it should be drunk over the coming 2-4 years. Peach and apricot-pie character that's very showy and very much within the sweet-pastry spectrum. There's also some spicy appeal to complement notes of cumquat rind. Pithy and focused. The palate has an exotic, tropical thread of mangoes, peaches and cantaloupe melon. Very hedonistic and regal — full of fat and very convincing viognier. A great vintage. Drink young whilst exuberant! Heather, creamed melon, pear and glazed peach notes form a flattering, hedonistic core, while light honeysuckle and ginger hints add nuance and range through the finish. Drink now through 2020. La Doriane is a luxury cuvée of Condrieu that E. Guigal has produced since the 1994 vintage. A great success since the first vintage, the wine always seems richly oaked and very fruity when young, transforming in 3-4 years into a seamlessly complex, aromatic and vibrant wine. La Doriane contradicts the accepted wisdom that Condrieu does not age well. VINEYARD The Viognier grapes for this wine are sourced from some of the finest sites in the appellation, including Côtes Chatillon, a steeply terraced vineyard overlooking the town of Condrieu itself. The other vineyards are Coteaux de Chery and Colombier, situated further south, and starting in 2005, Château Volan – an exceptionally steep, south-facing vineyard near the town of Malleval. The vines average around 35 years of age. Guigal performs several green harvests during the growing season in these vineyards to keep yields exceptionally low. VINIFICATION In the vintages 1994 through 1997, Guigal made the wine in a fashion similar to his ‘regular’ cuvée, fermenting a portion in new oak barrels (33% for the regular, 50% for La Doriane) and the rest in stainless steel. For the 2016 vintage, La Doriane was fermented and aged in 100% new oak barriques for 12 months, with a higher level of fine lees included in the fermenting must to help the wine integrate the oak character more completely. 100% malolactic fermentation. Bottled in June 2017, the 2016 Condrieu la Doriane is entirely barrel-fermented in new oak. This vintage seems more restrained and less rich than some others, but it remains marked by smoky, grilled apricot aromas and flavors. It’s nicely balanced and not overly opulent, retaining a sense of elegance on the long, spicy finish.